When we moved into our home, we also moved into some time-honored neighborhood traditions. One of which is an Easter morning Egg Hunt. All of the neighborhood kids really enjoy it and look forward to it every year. It’s a fun, easy, inexpensive way to get together with the neighbors. It’s also a great time to reconnect with everybody after being inside all winter. Even though the kids think that old Peter Cottontail has done all of the work, all of the organizing credit goes to my neighbor Pamela. She’s the woman behind the bunny. She sends out all the texts and lets the rest of us know how many eggs we need to stuff and what time we need to show up on Easter morning. All of the prep work takes place about a week before Easter. We stuff 24 eggs per kid per household. So for example if you have one kid you stuff 24 eggs, two kids 48 eggs, etc. Last year we added a twist and color coded eggs for the older kids, to make the hunt a bit more challenging for them. All of the eggs are then delivered (in secret) to Pamela’s house. In addition to the 24 eggs, a “golden” egg is also hidden for each child. I put golden in quotes, because sometimes the egg is gold, silver or even jewel toned, but the kids know it’s a distinctive or unique egg. The prize in this special egg is usually a dollar or something of more value than the candy or trinkets stuffed in the other eggs. The egg hunt really does not take that long, 30 to 45 minutes, tops. It’s Easter Sunday and many people have plans to go to church or to relatives, so we keep it short and sweet. All of the neighbors meet up at about 9:00 am, we take a few pictures and lay down the ground rules for the egg hunt. There are 12 kids of various ages that live on our cul-de-sac. Since it is Easter, sometimes we have cousins and friends that are visiting and they also join in. The more the merrier! The kids are divided into two groups – younger kids and older kids. 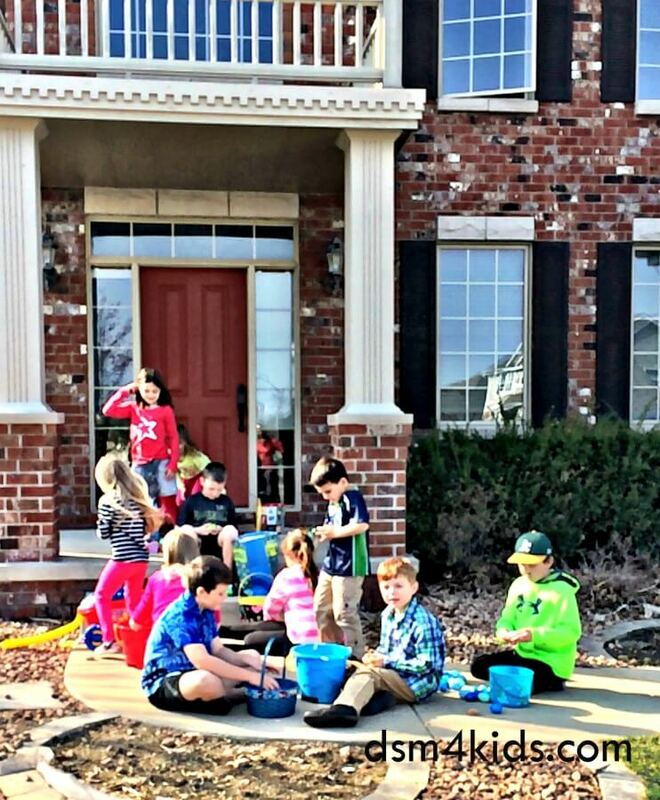 The younger kids find 24 random eggs and the older kids must find 24 eggs of an assigned color. 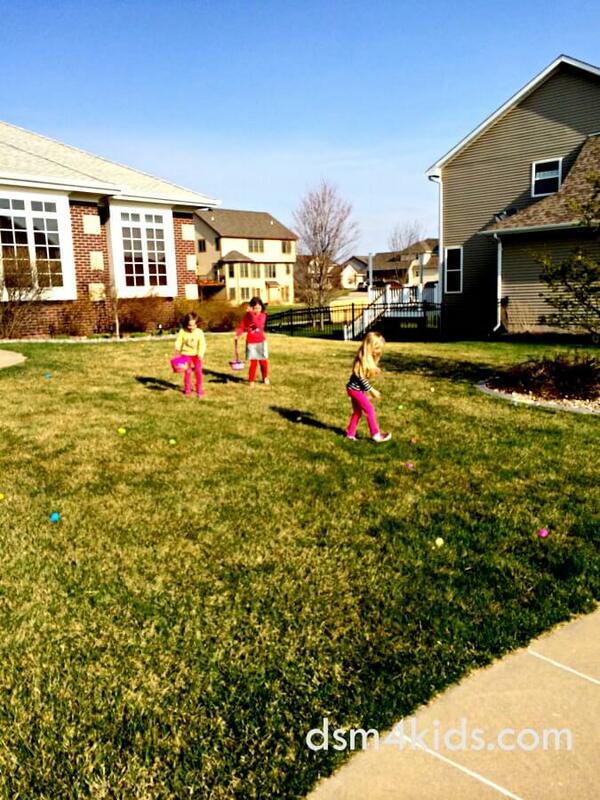 The groups take turns finding eggs in each of the eight homes’ front yards on the cul-de-sac. Once a kid finds 24 eggs+ one special egg they are done hunting. Once all of the eggs have been found it’s over. The hunters usually camp out in someone’s driveway or porch to crack open their eggs, check out their loot and eat some candy. Sometimes one of the neighbors will have donuts, but most of the time not. Not that you couldn’t, we just keep it simple and low key. In short, an Easter Egg hunt is a fabulous occasion. It requires only a modest investment in time and money, but gives a tremendous reward in fun. After the long winter, it is great to be outside, catching up with the neighbors. And, as all of the kids get older, there’s no need to stop the fun it just means they will be able to help with the preparations. What are your tips for planning a neighborhood egg hunt?